Angela V. Cook: Happy Release Day to BETHANY CRANDELL!!! Happy Release Day to BETHANY CRANDELL!!! Today is a HUGE day for my very dear friend, Bethany Crandell, and I couldn't be more happy for her. 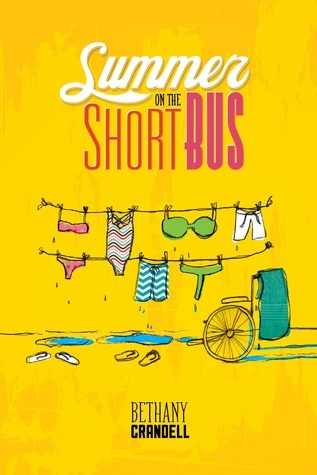 Her book, SUMMER ON THE SHORT BUS, is finally out! I remember reading this book very early on, long before her publishing deal, and thinking, holy crap--this girl is AMAZING! And then, of course, a wave of fear swept over me when I realized she was reading the manuscript I was querying at the time, which in my opinion, paled in comparison. Of course, being the incredible, supportive, and all-around lovely human being she is, she gushed about my book (even if it wasn't my best work at the time), and ever since then we've been huge fans of each other's work. Like I always tell her, I'd read ANYTHING she wrote, because her voice pulls you into the story and makes you FEEL. Whether it's laughing or crying, I always know I'm in for a ride (of the emotional variety) when I open up one of her manuscripts. So, enough of my ramblings, let me introduce you to SUMMER ON THE SHORT BUS! If you're looking for something different...a book with a main character who's honest, maybe not always likeable, but real; I highly recommend checking out this book. You will laugh, root for the underdogs, and maybe even feel a little uncomfortable at times. SUMMER ON THE SHORT BUS is so different than everything else out there and easily one of the best young adult contemporary books I've ever read. I can't wait to see what Bethany Crandell comes out with next! *sniffs* I just heart you to bits & pieces. And YOUR manuscript was FABULOUS! And I couldn't be happier to know that the world will get to read it very soon!! !